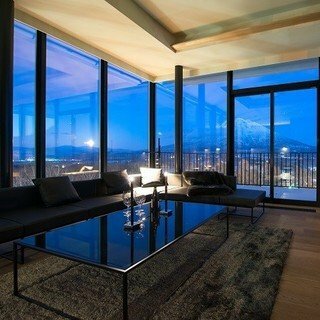 Unwind in a boutique luxury property offering four beautiful and contemporary apartments with outstanding views of Mt Yotei and a dedicated winter concierge service available 8:00-20:00 (winter months) making your stay more convienent and more enjoyable every step of the way. A day spent at LOFT begins with a call to the concierge team, who can have your skis/snowboard ready to go in LOFT's own vehicle, then get driven to your choice of lift in Hirafu. Whether you're a first-timer achieving your first turns on the green runs or a devoted powderhound exploring backcountry, with the variety of terrain you are sure to have an unforgettable experience on the mountain. Save on roaming costs and place another quick call using your LOFT provided mobile phone, to have one of your concierge team relive your tired legs and drive you back to LOFT for a touch of relaxation. Get cosy next to fireplace and feel awe-struck by Niseko's impressive landscape through floor to ceiling windows showing off the impressive Mt. Yotei. Take advantage of your concierge's local knowledge and get help making reservations at some of the best restaurants Niseko has to offer. Following either an authentic Japanese feast or delicious international dinner choose to dance the night away in one of the lively village bars or head back for an early night to be ready for the fresh pow in the morning. "Great stay. The apartment is very beautiful, and the concierge service with transportation is a must in Niseko. We booked a lot of activities and restaurants through the concierge service and also used the transport van to go to those places. 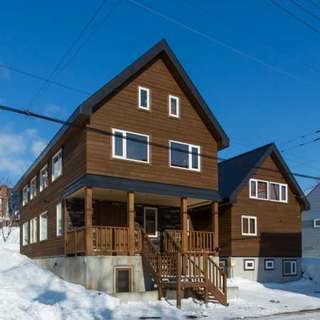 Highly recommend Vacation Niseko and LOFT." "The style of these apartments is super cool. While there is plenty of luxury in Niseko, there are only a handful of properties like the Loft Niseko that have amazing views of Mt Yotei. All apartments feature an Nespresso coffee machine which is a "must have" for coffee lovers like me! Each apartment comes with a washing machine with an integrated dryer.While these kitchens are ample for preparing meals, in Niseko who needs them?! The location is brilliant and you are walking distance to all of the great restaurants of Hirafu. Perched on Middle Bluff – the cliff between Middle and Lower Hirafu Village, all four Loft apartments enjoy unhindered views of Mt Yotei, the sleepy lower village and surrounding snowscape. Topping it off is the onsite concierge that is always on hand to take your skis, book restaurants and activities, or drive you to the lifts or around the village. Luxury!" "My family and I have just spent a magical 4 days at The Loft. We were greeted by such friendly staff and it certainly didn't stop there. The wonderful Emma, Alex and Craig made our stay nothing short of incredible. Their efforts went above and beyond and we could have not been more appreciative. As for the apartment, we had the most tremendous view waking up to Mt Yotei every morning. The apartment was comfortable and clean but above all the customer service truly made our experience well worth the travel from Australia! Thank you!" "My husband and I stayed at the magical Loft Niseko for 4 spectacular nights and we loved every moment of it! A super luxurious home away from home. Fully equipped with the most stylish accents and hi-tech gadgetry, this is a minimalist and serene place to stay. Located in the village, within walking distance from the awesome restaurants all around - it's just perfect. Also walking distance to the slopes but if you're not the walking type...the unique and heavenly concierge service is Out of this World!! They will take you where you need to go and book you into the top restaurants - they are the dream team! Each loft apartment provides you with a local mobile phone too - super useful, for calling the local spa...if you fancy it...or calling Niseko Loft concierge service to book activities for you or to pick you up or drop you off at different locations at the start or end of your day! Niseko Loft have really thought of everything! My husband and I highly recommend this exquisite stay and we look forward to returning soon." "The Loft is a cosy cluster of fabulously attired apartments by Yoo the interior design leg of Philippe Starck. More like modern boutique apartments with full concierge service. Right in the middle of Hirafu village perched on an escarpment with glorious views of Mt Yotei. Such a treat to stay there. Fully equipped state of the art kitchen which would delight any chef. Restaurants are in abundance nearby or chauffeured by the concierge. Whatever takes your fancy. We stayed in both the penthouse apartment as well as the expansive garden apartment. Definitely will stay again."